The European Union has removed additional import controls placed on Egyptian strawberries, following Egypt's implementation of "very rigorous" inspection standards for its exported produce of the fruit, Egypt's agriculture ministry spokesman told Ahram Online on Thursday. The tight EU regulations were introduced amid agricultural export bans on a number of Egyptian crops due to pesticide residues, spokesman Hamed Abdel Dayem said, not specifying when the controls were first put in place. The EU's European Commission said on Tuesday that Egyptian strawberries were removed from a list of imported animal feed and food of non-animal origin subject to the increased level of official controls. The decision came after "available information indicates an overall satisfactory degree of compliance with the relevant safety requirements provided for in Union legislation and for which an increased level of official controls is therefore no longer justified," it said on the European Union's official website. 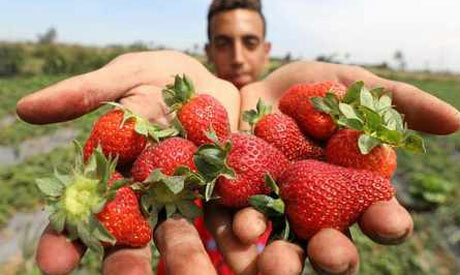 Abdel Dayem said reversing the measures will help the country boost export of the fruit to the EU countries. The agriculture ministry said in April that the European Commission recommended lifting the additional controls, before members of the Commission's standing committee on plants, animals, food and feed voted in favour of scrapping the intensified measures earlier this week. Saudi Arabia also lifted its ban on Egyptian strawberries and pepper in April. The nine-month ban had been in place since July 2017. A string of agricultural export bans imposed due to pesticide residues were lifted last year. by Kuwait, Bahrain, and the United Arab Emirates. Egypt seeks to boost its exports after a currency floatation in late 2016 diminished the Egyptian pound's value substantially. The country's agricultural exports rose by 13 percent between September 2017 and April 2018 to reach 3.165 million tonnes, compared to the same period last year, according to a statement by Egypt’s Agricultural Exports Council last month.